Moving back, full time to Micro.blog hosted blog from self hosted Wordpress, went far smoother than expected. For the most part the experience has been interesting. It’s interesting to try and replicate some of the features of Wordpress on MB without having the crutch of a massive library of Wordpress plugins available, which means that for some things, like Related Posts and outside Comments one must find a third party provider and do some theme editing on MB. Tools effect behavior and I’ve noticed some effects on me with the differences between WP and MB. Some of these are good, bad or neutral, but all are something I notice. I post less on MB. I’m not sure if this is good or bad. On WP I had bookmarklets and browser extensions that made sharing URL’s and snippets of interesting articles to Wordpress very easy. MB has none of that so there is more friction to sharing. I find myself using the Pinboard bookmarklet much more and saving as a bookmark to Pinboard instead of sharing. That’s kinda not good. Markdown - I had harbored thoughts of making long posts on MB in HTML. But, having learned a bit of Markdown, I use Markdown. Not good or bad, just different. Draft Posts - I really miss being able to save half finished posts as drafts to work on later. I’m using Simplenote as my work around. I compose most everything on Simplenote and then paste to MB. Comments from the Indieweb - one of the things I truly loved on WP and miss deeply on MB was receiving Comments and mentions from both other Indieweb equipped blogs and Twitter and the Micro.blog timeline and having them all displayed on the proper post page (after moderation.) Hopefully MB will grow into that. Soon. No more Scud Hunts - the bad thing about WP was - WP is such a mess. Things would constantly break, which would lead to my wasting a lot of time trying to find the source of the WP breakage in a Scud Hunt. On MB all that stuff is managed and support is excellent and that is no small thing. I spend a lot less time fixing things and worrying about things on MB. I’m still getting used to Themes Without Sidebars (one column themes). I added a third party comment host to MB. To my surprise, it’s been used much more than I ever thought it would by three groups: a. Micro.bloggers that want to comment but don’t want the comment to appear on the MB timeline, b. Indieweb people who realize they can no longer contact me from their own blogs, c. total strangers. I added commenting, because I was leaving Facebook and some very dear friends behind and I wanted to give them a chance to comment on the off chance that they might be reading my blog blatherings. I never expected this much use, so I’m doubly glad I added comments. Syndication: On WP I was using JetPack to syndicate to Twitter and it worked. But I think MB does a better formatting job on syndication to Twitter. Built-in Social network: Never underestimate the value of having a really good social network intertwined with your blog. This is where Micro.blog blows away the competition. A lot of old time bloggers, back in the 00’s quit blogging not because of Twitter and Facebook, but because they got tired of having no feedback other than spam. We blog, publicly, partly for interaction and when you don’t get that occasionally it’s hard to keep talking to yourself. Micro.blog is great for posting photographs and is easier than WP. I say this not that I think I’ve found the cure for my sideways photo syndrome. For awhile there I wasn’t sure if it was me, Android or an Essential phone problem. I think I fixed this. Even though I’m getting used to single column themes on MB, I have to say the stock theme selection on MB is, IMHO, quite good. Limited, but quite good. The third party “Related Posts” service I used isn’t very good at figuring out which posts are “related” to the current posts. I renamed it to “Recommended Posts” in the interest of truthiness. But, when positioned directly beneath the content, they do get used. So a few people are exploring deeper into the blog because of this. I still have not added a third party email contact form to my MB blog because I don’t have a compelling need for it other than my conviction that it should be a standard option. But I can see that people using a Micro.blog hosted blog for business or authors, freelancers, journalists etc. blogging on MB would really want a contact form. I did put a email address up, but its encrypted so that most spambots cannot read it. Not as good as having a form though. Markdown does not appear to have nofollow or open in new tab or window type links. I really like the Indiepaper, read later service bookmarklet and it’s integration with Micro.blog. I also like using Indiebookclub which Micro.blog gives me access too. Kewl. I was getting bored so I just switched my Micro.blog hosted theme from Marfa to Typewriter, which somehow seemed appropriate. Both my Related Posts and Intense Debate comments moved to the new theme. Yay. I added a DuckDuckGo site search to the Footer. That’s enough High Level Coding excitement for me today. Eventually, I want to add a site search form somewhere in the header space but I need to figure out where and then try to find the template it should go in and where on that template it should go, so it needs some study. Just a re-reminder for Micro.blog users: you can get the customizable code for the DuckDuckGo site search here. I thought I would repeat this in light of our new ability to customize our hosted blog templates on Micro.blog and where more people might want to add site search to their hosted blogs. “Marfa” theme already has a site search box built in near the bottom. It got me thinking that if I ever wanted to change themes I’d definitely want to add DDG site search boxes to the theme: probably one search box near the top right above the content and another near the bottom. This saves a lot of scrolling on long posts. I like the DDG search box because you can get rid of all branding and just have a plain box. Putting the Related Hosts so they would appear at the very bottom of the page just was not working. On my pages, I doubt anyone scrolls down past the comments form so nobody was seeing them. I swapped out the JS code for the “Inline” type display. This requires two separate JS code snippets: 1. A general call code snippet, which I placed in the footer, 2. A second snippet which I placed in the Post template as described in the link above, you place this where you want the Related Posts to appear, which is right below the content where a visitor has the chance to see them. My observation so far is that if AddThis has a relevency algo it’s pretty weak. I think these are more random posts from this blog. Not real good, but not all bad if it gets people to explore other posts on the blog. So now I need to watch my stats and see what paths visitors, particularly those from search engines, take, and also monitor how related the posts becomes over time as AddThis learns about more blog posts. I’m rebuilding my Following page (aka Blogroll). After dithering between trying to do it on Micro.blog as either a static page or as a category, I opted for creating a Following category because I think it will be easier to maintain. Added one short post per followed URL. Click Posts and Edit each Following post to check Following category. On the Web the category options only appear after 270 characters so getting short posts into a category requires this extra step. Navigation: I wanted to put Following on my Navigation Menu, so I created a Page named “Following” and pasted the URL to the Following Category in the page content. On Micro.blog, if you only paste a URL into the Page content it creates a redirect. So now it looks like there is a Page named “Following” in my navigation but it really sends you to the “Following” Category. See it here. I’m adding only 2 - 3 blogs a day so I don’t spam up the MB Timeline too much so this will take awhile. Anyone familiar with Wordpress knows about the Related Posts feature as part of JetPack. This places 3 links to other posts you have written with similar content just below each post on WP and it does a pretty good job of it. I think Blogger has a similar function. It took many months, but what I noticed, over time on WP is that visitors, often helicoptering in from search engines, would actually use the Related Posts to explore deeper and read more posts on my blog, which is what I wanted. I knew I would be giving that up when I moved to Micro.blog which does not have a Related Posts option. (For good reason, to do Related Posts right and make them relevant takes quite a bit of programming and overhead and it’s not vital to the MB service in the way editing templates or categories are.) But I started wondering if there was a third party hosted service that would do it and discovered two that are not just Wordpress plugins, but usable on most websites. AddThis - they have a number of tools and a Related Posts JS is one. Slider - I hate sliders so I skipped that. Inline - This puts the Related Posts in among your content, not my favorite but I might try it if it will put the related posts immediately below the content and above the Comments. Must experiment. Footer - The related posts show up in the bottom of the page no matter what. Don’t let the name fool you the code goes in the Post template not the Footer on MB. You install the unique JS code just like I installed the Comment Code in the template. Once you install the custom code on your template you need to manually bring up individual blog posts. As near as I can tell this calls in AddThis which scrapes the page and adds that page to it’s list of your pages. Per AddThis: it takes about 24 - 48 hours for related posts to show up. As I write this, I’m less than 24 hours into it so it’s too early to know anything. When I installed this my blog title was kinda long. Add This wants to put the full title before the post title so all related posts look like they have the same Title. You have to mouse over to see the rest of the post title. I have shortened the blog title but I may have to manually call fro a re-scrape. I’m not sure about relevance. The long blog title might be messing things up. Right now it looks like it’s just suggesting random posts, but that might still be better than nothing. I’m not sure how relevant this will be even under optimal conditions. We will see. I focused on having it scrape long form blog posts. The Footer style code always appears at the bottom of the page. This is not all bad since it does not interfere with the rest of the page content if it loads a little slow. It will slow page loads slightly. Not a problem with the Footer style code. You can get rid of the AddThis branding. Fortunately the branding is small. I like that the code does not tack on Sharing buttons or other stuff I don’t want. It does adapt to mobile. Will it Increase Page Views? That is going to take a few weeks of testing. I don’t think it will hurt. Since it appears in the footer it is quite far down on the page. I will let you know as I experiment. If anyone else decides to experiment with either of these services please let me know! Thanks. * Ability to reply via webmention. Replies from Micro.blog timeline should appear on MB hosted blogs. Comment form with antispam protection on MB hosted blogs. Ability to send Trackbacks and Pings. Narrative: as @Manton mentioned in the latest Core Intuition the part of Micro.blog that sustains the service (pays the bills) is the blog hosting half. So, to me, that service needs to be compelling as a free-standing blog host to attract and retain paying customers. By now most blog services have the same old list of standard features those do need to be looked at and included on MB, but IMHO, the thing that no other blog system has is turn-key, out of the box true Indieweb discussion support. Micro.blog is much further along than anybody else in this regard but what it’s missing is in that bullet list above and that list is in rough order of importance. Having those would differentiate the MB service from Blogger, Wordpress.com and all the rest. Own the niche. Indieweb type discussion is the only really new thing out there in the blogosphere, and it’s doable. Why? I think when potential customers see how much interaction there is on MB hosted blogs they will find that a compelling reason. The comments and mentions appearing right on the hosted blog’s post pages would be visible proof of activity - and people respond to activity. (These things should have an off/on switch so the blog owner can enable/disable as they choose.) I also think this is viral - interest will spread by word of mouth. I do suspect that most of these are in the pipeline but feedback is good and making MB hosted blogs more like stand alone blogs is good too because people will be less likely to look to WP, Blot or other scripts for their blogs. Sometimes we create PAGES on a blog that contain content that we would like visitors to be able to comment about. I’ve been trying to figure out how to add hosted comments just to a page on MB, full stop. I had examined all the templates and found no good place to insert the commenting JS code. And even if I had found a place the added problem would be: I only want comments on certain pages not all pages. What to do? Goto: Account > Edit Design > Pages > select a page to edit. It’s that simple. You have to repeat this for each page you want comments on. It will not appear on all pages automatically. You can see an example on my World War II Movies List page. I’ve only done this with IntenseDebate code but it should work with others. This is my crude guide to adding third party commenting to Micro.blog. Right now Micro.blog only has commenting in the social timeline. If you want non-Micro.blog members to comment on your post pages you will need a third party service I know @Manton intends to add commenting on the post pages to MB at some point in the future so I consider this to be an interim solution. Pick a comment service and sign up. Watch Manton’s Screencast I watched this several times until I was pretty sure I knew what to do. Go to Edit custom themes in your admin panel. You want to fetch the template files for the theme you are using, so find the repository name for your theme. I’m using Marfa theme so I typed in “theme-marfa” and if memory serves all the Marfa templates were fetched. 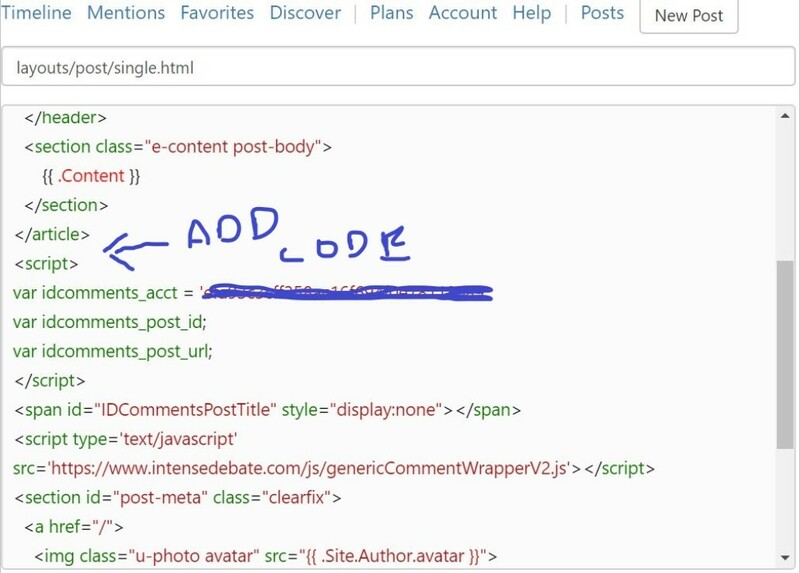 You are going to paste the JS code from your custom comment provider right where my super crude arrow is pointing below. Save and you should be done. I’ve only done this with IntenseDebate using their “Generic” code so I can’t tell you how the other services will work on MB. YMMV. There is no way to save a half written draft of a post in Micro.blog. So today’s task is find an easy text note software that will let me write a rough draft, save and come back later. I need it to work across many devices ans operating systems. So SimpleNote might work. SubToMe has a universal subscribe button (code at the link) that you can put on any Micro.blog footer, Page or anywhere that takes HTML. SubToMe has a great list of real feed readers that the subscriber can choose from without all the social network sites garbaging up the list. Readers include: Inoreader, Feedly, Wordpress Reader, and a bunch more. The button is free. Indiebookclub works great with Micro.blog. You probably knew that but it’s the first time I’ve used it. Micropublish.net really only works with Micro.blog for Notes. The rest of the Post Kinds don’t work right ie. Bookmark has no link. However Notes in Micropublish does allow the browser spellcheck to work which is better than the MB web Post form. Analog things. A big catchall for stuff below. But you also have Micro.blog things like: historians, educators, blot users, cat owners, etc. A webring plays to the strength of MB users actually having a blog. Currently, Micro.blog hosted blog users can put a webring code in their footer area. The size is a bit cramped but it is usable. I expect this to get better in the near future when Micro.blog rolls out improved template/theme editing capabilities. The easiest, off the shelf, webring hosting solution is Webringo.com. * It works and has some nice features. Webringo automatically produces an Index page of sites within the ring. If you link to this it gives people an alternative way to explore the ring. A webring is opt-in, that is membership is voluntary. A @JohnPhilpin noted it can denote a club or tribe. I would strongly recommend that the ring owner provide some example, optional, “minimalist” HTML ring codes that members can customize to work with their membership if they want. The advantage to using Webringo is it makes managing the ring much easier and joining the ring less labor intensive. You can create something like a webring using Glitch or other means, using a host like Webringo makes it easy for anyone to start and maintain a webring without coding skills. Micro.blog has grown enough and will continue growing so finding sub-communities will become harder. I’m just throwing the idea out there, for whoever is interested to think about. I will make this offer: If people start forming webrings for sub-communities within Micro.blog I will create some sort of index of the webrings so people can find different rings. * I’m not married to Webringo, it’s just that when I investigated the other two ring hosts, Webring and Ringsurf, I was getting error messages when I tried to sign up and they were still giving errors when I came back a couple of weeks later. Whereas, Webringo is still fully functional. Micro.blog (MB) has two elements the 1. hosted blog and 2. the social network. They exist sort of separately but they are also intertwined. You have to have a blog, either hosted on MB or elsewhere, to be a member of the MB social network. Micro.blog can certainly be many things to many people–possibly too many. In large part, what it is depends on what tools you’re bringing into it and how you’d like to use it. a low barrier entryway to having your own IndieWeb-capable blog on your own domain. a first class IndieWeb citizen with support for multiple types of posts, IndieAuth, Webmention, Micropub, and Microsub. Chris pretty well sums up all the things you can do on Micro.blog. As the name Micro.blog implies the primary thing you can do on it is write short form posts like Twitter and Facebook. But you can also post long form posts just like you would on a conventional blog, just keep typing and when you hit 280 characters in a post a Title Field appears and you are long form posting - effortlessly. There is no friction or barriers between you and just writing. Posting is easy, like posting on Twitter and the blog just auto-generates itself. You can post, “I like pizza.“ You can post a picture of your cat plus a poem about your cat. You can post a 600 word essay about the Chicago Cubs. Whatever you want, however short or long you want. It’s one of the features I like the most. Posting photos is very easy on MB. There are quite a few dedicated photoblogs there. What is the difference between Twitter and Micro.blog? I was going to write a big long comparison between Micro.blog and Twitter then Facebook, but I don’t think I’m really up to the job. Which is why this post has been sitting in my Drafts bin for several weeks. Here is the best thing to do: Micro.blog offers a free trial. Sign up and really try it for the trial period. You can set MB to cross post to Twitter so all your posts appear on both MB and Twitter at the same time. Give it a try. discontinue the hosted blog, it will no longer work but the social network will still work. See below. Even if you choose #2 you can still participate on the social network side of Micro.blog for free. Just go get an outside blog like at Wordpress.com and attach the RSS feed to your Micro.blog account. Every post you make on your outside blog will also appear on MB for free. You need the outside blog to start new conversations. You can reply to others directly on Micro.blog. But either way, if you are looking for a replacement social network I urge you to give Micro.blog a try on the free trial. This is Part 2 in a series. Part 1 is here. Here in Part 2 I’m going to recommend 3 blogging platforms as good places to get started. I’m also going to make the case for going to the added expense of buying your own domain. You can investigate each. Wordpress.com - Free with ads on a subdomain (ie. MYBLOGNAME.wordpress.com) $4 per month, charged annually, to use your own domain (ie. myblogname.com) and get rid of ads. Wordpress.com gives you a lot for both free and paid versions. You can set it up to cross post to Twitter, Linkdin, Tumblr, Facebook (post to FB Page only), G+ (being discontinued by Google). Wordpress was designed for long form blog posts. You can micro blog and photo blog from it but posting updates is not quite as fast and easy as Micro.blog. Self Hosted Wordpress - This requires more experience of an intermediate level. You must have your own domain. What I recommend is you get your own “C-Panel” type hosting account, which will give you a easy setup wizard to install your own instance of Wordpress blogging script. Self hosting gives you the most control. If you like to arrange things “just so” self hosting gives you thousands of plugins which can add capabilities to your blog. Self hosting Wordpress costs only a little more than Micro.blog or Wordpress.com but it is a bit more to learn. Ramblinggit.com is a self hosted blog. There are dozens of blog platforms but the reason I chose these three is that you can move your content easily between the 3, especially if you use your own domain. One big reason to post from your own blog is keeping control of your own content. If you are coming from Twitter or Instagram Micro.blog will feel comfortable. MB is very good with Tweet-sized posts and posting photos. You can do long form posts too. There are many iOS apps for MB. Android, Windows 10 and Linux users will need to use the web browser to access and post which works quite well. If you just want to write, short or long form, and hate being bothered with the blogging platform itself Micro.blog is a good choice. MB only charges your credit card monthly so there is no lock-in. If you don’t like it you can move to a Wordpress option. If you are coming from Facebook and most often write longer posts then you should consider Wordpress.com on your own domain as a place to start. You have to pay a year in advance so there is lock-in, but you can use that year to blog, grow your readership and learn how to use basic Wordpress. At the end of that year you can decide to stay or move to either Micro.blog or self hosted Wordpress. About 25% of websites are using some form of Wordpress. Learning wise it’s not a huge transition to self hosted WP. There are more steps but it is far more capable. This is something to graduate to from Wordpress.com or if you already have past experience with other self hosted blogging platforms. A lot of people had blogs 10 or 15 years ago and gave them up for Facebook and Twitter. You establish your own address or home if you will, on the Internet. You own the domain it is like a permanent address that stays the same no matter what host you are on. Your hyperlinks will not change. So if somebody has bookmarked one of your posts or linked to it on their own site the link will not be broken even if you move. You register your own domain through a registrar like Godaddy or Hover. Buying a domain is a good first step before shopping for a hosting platform. I like to keep domain registration always separate from my hosting. Don’t feel limited to getting a *.com domain. In the old days individuals often used *.org to represent a personal blog because it was less commercial sounding. *.info, *.blog, *.name, *.me and a host of others can also be used. I may do followup posts giving more detail on each option but this will get you started investigating each one. If you have questions feel free to post them in the comments below. I will answer. Part 3: Creating the Blog Network continues the series. This is a social network username directory. If you know your friends username on Twitter, Micro.blog, Mastodon or (defunct) App.net you can find their handle on the others. Very handy if someone you follow has left Twitter, or if you are migrating to some new social networks and want your friends to find you.